MOSCOW. July 8 (Interfax) - Russian ferrous metal exports in tonnage inched down 0.4% year-on-year in January-May 2016 while exports in value plummeted 28.2%, the Federal Customs Service (FCS) said. Exports to non-CIS countries were up 1.2% in tonnage but down 28.8% in value, and exports to the CIS fell 9.7% and 25.5%, respectively. Ferrous metal imports fell 1.1% year-on-year in tonnage in January-May. Imports from non-CIS countries fell 16.3% but imports from the CIS grew 10.6%. In value, overall imports fell 15.5%, with drops of 18.2% for imports from non-CIS and 10.9% from CIS countries. Coal imports fell 9.6% in tonnage and 50.9% in value. Imports of steel pipe rose 28.7% in volume and 0.1% in value. The events surrounding the naming of the bridge also channeled the deep tension and discontent that exists in Russian society toward the North Caucasus. Over the last few months, media reports covered an attack on a bus full of Russian and foreign journalists, Ramzan Kadyrov's call to try all opposition activists for "subversive activities," conflicts with human rights activists and federal security forces, as well as the news about the transfer of control of the local oil industry to Chechnya (for which separatists and Akhmad Kadyrov himself once fought) and Ramzan Kadyrov's complaints about a shortage of federal money. All this provided a negative background for the authorities' heavy-handed step to promote the image of Chechnya. "Perhaps this promotion is necessary; many efforts in this regard, by the way, are quite successful," said Remizov. "But this example had an opposite effect. It is about the lack of a sense of proportion in promoting the interests of the Chechen Republic in the public space." I don't see a problem. Alberta in Canada owns its oil and gives Ottawa the middle finger if it feels that Canada is trying to take it from them. Chechens from gaining something from this oil then it would be stoking resentment. There is a very high unemployment rate in Chechnya. mitigate this pool of potential terrorists then that is a very good thing. This budget process will be different from previous ones: more is not spending money on priorities there by redistributing what is said Finance Minister Anton Siluanov at the end of a cabinet meeting. Yesterday the Cabinet as a whole approved the freezing of expenditure in nominal terms for the upcoming three-year - they amount to 15.787 trillion rubles. (It is less refined, the 2016 expenditures). The budget deficit Ministry proposes to reduce the annual rate of 1 p. p. with the forecast level of 3.2% in 2017 to 1.2% in 2019 is already frozen in nominal terms, spending is waiting for further reduction of 5% in 2017 so called unprotected costs can be reduced by 5%, said Siluanov, but "it is a question of point solutions." Reduction of 5% unevenly indicates federal official: four programs costs are rising, while the rest are reduced by 30 or 40%. For example, limits on the state program of socio-economic development of the Far East and the Baikal region is proposed to reduce at once to 20 times in the three-year. "Ministers today at a meeting of the government were outraged and asked the Ministry of Finance, so why cut it. The Prime Minister reassured them, saying that it is only the beginning of work ", - says participant in the meeting. Ministries and departments have to decide what you can to reduce and redistribute, insists the Minister of Finance. However, he expressed his willingness to help them in this: in the near future the Ministry of Finance will meet with key departments and help them to find the extra costs. "We will be forced to deal with the optimization and the identification of inefficient budget spending" - complained Siluanov. The Finance Ministry does not believe in the recovery of oil prices, so lay in the parameters of the budget the average annual price of $ 40 per barrel (the average price of a barrel of Urals for six months - $ 38). When uncertainty is better to reduce the non-oil deficit - Finance Ministry intends by 2019 to reduce it to 2 times - from the current 9.1 to 5.4% of GDP, said Siluanov. Allowance, despite the fact that they will decrease, remain one bag, which will ensure the fulfillment of obligations under any conditions, and promised the minister. However, according to projections of the budget referred to by the Reuters news agency, the reserve fund will end in 2017, and from the Ministry of Finance plans to take the FNB 783 billion rubles. in 2017, 883 billion in 2018 and 87 billion in 2019 in the NWF July 1, was 4.68 trillion rubles., of which more than 1.5 trillion rubles. taken by VEB and other projects. In view of the plans for financing the deficit in it will be only 500 billion rubles available by 2019. These plans may lead to a decrease in Russia's sovereign rating by one notch further, the analyst Raiffeisenbank International Gintaras Shlizhyus. To deal with the Ministry of Finance also intends deficit, increasing debt. In 2017, net borrowing will increase by 4 times - from the current 300 billion to 1.29 trillion rubles. in 2017 the Ministry of Finance hopes to accommodate such large-scale linked to the liquidity surplus in the money market (it has arisen due to the fact that the Ministry of Finance began to spend the reserve fund to cover the deficit) and the interest of foreign investors. "We believe that the share of foreigners, who will participate in the purchase of our securities may be increased in the next year", - said Siluanov. Thus, the state is the main contender for all the free resources on the [domestic] market, said earlier the chairman of the Center for Strategic Research Alexei Kudrin. The growth of loans from the government may lead to leaching of private borrowers from the market, but not completely - the means for them to remain, estimates Dmitry Polevoy from ING. Grow the economy ministry proposes through private investment that will come after the decline in inflation and the disappearance of the volatility in the foreign exchange market. Over the last two years, foreign direct investment in Russia fell from $ 70 billion to $ 5 billion, restoring only their size will give an additional 4 trillion rubles. investments in the year, counting Kudrin. Resource for domestic investment is also rather big: term deposits of enterprises by the end of 2015 almost equaled the annual investment. But in the investment environment changes over the last few years, moreover, strengthens the role of state actors, laments Natalia Orlova from Alfa Bank. Policy of the Central Bank and Ministry of Finance aimed at achieving low inflation, and a package of measures that would stimulate investment and, as a consequence, economic growth, no, she says, "Come private investment we can simply not wait." Separately, inflation targeting and a tight fiscal policy - it is right, but the two components is not enough if there is no structural change in the economy. The Finance Ministry is mobilizing all resources to fight the budget deficit: in 2017 will be fully spent reserve fund, and by 2019 most of the available assets of the National Welfare Fund (NWF), net loans amount to 4.2 trillion rubles. for three years, Reuters reported with reference to the materials to the draft budget for the 2017-2019 biennium. The figures confirmed "Vedomosti" a federal official and a Finance Ministry official. From the Ministry of Finance plans to take the FNB 783 billion rubles. in 2017, 883 billion in 2018 and 87 billion in 2019, "If you run out of the reserve fund, the National Welfare Fund - exactly the same reserve fund," - said Finance Minister Anton Siluanov. In the FNB on July 1, was 4.68 trillion rubles., Of which more than 1.5 trillion rubles. taken by VEB and other projects. In view of the plans for financing the deficit in it will be only 500 billion rubles available by 2019, writes Reuters. To make ends meet, the Finance Ministry intends to increase net domestic borrowing to 1.29 trillion rubles. in 2017 to 300 billion in 2016. In 2018-2019. they increase to 1.47 trillion and 1.44 trillion rubles. respectively. Spending on debt service will grow gradually - from 646 billion rubles. in 2016 to 891 billion rubles. in 2019 considering the option that the reserve fund will end this year, said a Finance Ministry official. Finance Ministry spokesman did not respond to the request "Vedomosti". The Ministry of Economic Development does not agree with the approach of the Ministry of Finance to the reserve. It is supposed to mobilize all resources for the execution of the budget (including privatization) that will keep the funds, said the ministry official. But domestic borrowing position close to the ministries. The ability to increase net loans in the amount of 1.5% of GDP in 2017-2018. admitted earlier the Minister of Economic Development Alexei Ulyukayev. The proposed design of the Ministry of Finance suspended compromise, official estimates of financial and economic bloc, but so far there is no decision on the pension and tax systems. Now the Finance Ministry is funding the deficit from the Reserve Fund (in April - May, spent 780 billion rubles.). This leads to a structural surplus of liquidity in the money market, but increase the lending banks will not rush to: debt instruments of the Central Bank and Ministry of Finance attractive, found the Association of Regional Banks. In fact, the Ministry of Finance itself has created a surplus of liquidity, and gather its own, increasing the loans, the official said. In such a situation it is logical to take, estimates of Dmitry Polevoy of ING, which is good for the Central Bank, which is in favor of financing the deficit borrowing, not reserves. It is leaching private borrowers from the market, but not completely - the means for them to stay, he said. In 2017 the Finance Ministry is waiting for the deficit of 3.2% of GDP, and plans to reduce it to 1 n. N. A year (see. Chart). Total deficit in the 2017-2019 biennium. may reach 5,3-5,6 trillion rubles., based on the current Ministry of Economic Development forecast nominal GDP (which may be reduced due to lower forecast for inflation). "To finance such a large, though, and 3%, the budget deficit, taking into account the reduction of reserves at the expense of domestic borrowing - it's a big risk" - Siluanov warned. On Monday, the government's budget commission approved a budget freeze in nominal terms at the level of 15.78 trillion rubles. per year for the entire three-year. The final decision will be taken at a cabinet meeting, said Ulyukayev. Options to impose budget a bit and the Ministry of Finance calls them, says Alexander Suslin of the Economic Expert Group: "Raise taxes, freeze spending, take a lot - in the end, all three in anguish. And then, perhaps all a little bit will be approved: raise taxes a little bit, a little spending freeze, a little take on the market. " What is this crap? We have 1.95 trillion rubles being the equivalent of $30 billion (64 rubles per dollar) as the deficit for 2015.
if 1 trillion rubles were being withdrawn from it every year. Yet Russia is going to collapse from a 2.6% deficit in 2015 and possibly up to 3.2% deficit in 2017? What utter garbage reporting. Very informative.. thanks for sharing that. kvs wrote: What is this crap? We have 1.95 trillion rubles being the equivalent of $30 billion (64 rubles per dollar) as the deficit for 2015. You are talking about Central Bank Forex of 390 Billion USD , that are not reserve or national welfare fund , Those fund are for central bank to pay for import and prevent volatility of rouble should it arise from macroeconomic pov. I think what they are stating is Reserve fund would end in mid 2017 and if the same rate of spending continues then NWF would end by 2019. What does UK , US or EU has to do other the print Pound , Euro and USD and just add some numbers to their every growing debt , As long as World Keeps buying their treasuries they would be offloading all their deficit and debt on the world and the party continues till it last ! I think what they must do is to increase their public debt from current 14 % to 20 % via domestic borrowing , 1 % of debt earns some where around 950 billion roubles that should earn them around 5 trillion roubles. Just borrow in rouble and pay in rouble so that you dont have to spend USD/Euro from NWF , much like Japensese do they own most of their debt and thats a sweet 250 % of their GDP. Looks like 1/3 of National Walfare Fund would be spent by 2019 which means only 1 trillion rouble will be left and domestic borrowing would be at the tune of 4.2 trillion rouble. The Russian government must have been collectively chuckling over their coffee when they read the Reuters exclusive revealing that Russia's reserve fund will be empty by mid-2017 and a larger Wealth Fund would be nearly empty by 2019. The money would be spent to cover a cumulative budget deficit of RUB 5.9 trillion (just over $92 billion at the current FX rate) in 2017-19, as well as over RUB 2tn in 2016. It's not that this is incorrect -- the federal budget deficit would need to be covered and reserve funds would be used up. However, neither the government nor the Russian central bank have plans to actually sell billions in FX reserves that have been sitting in government accounts. As has been happening for some months now, the central bank of Russia might simply print roubles to cover the budget deficit, while leaving FX reserves intact. 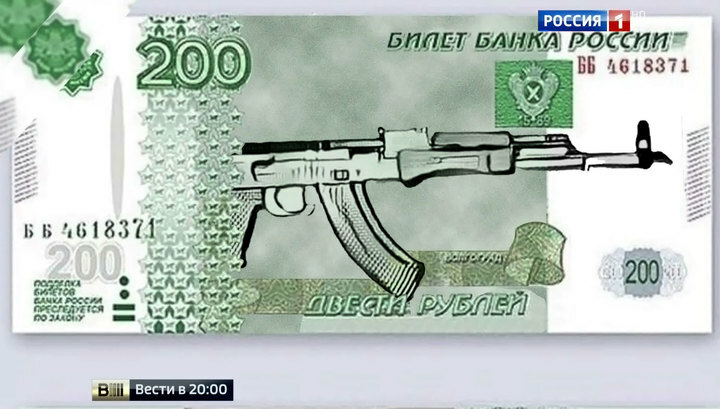 For the Russian central bank, it involves taking FX from the left pocket and putting it into the right (the left pocket being government FX reserve accounts at the central bank). The government gets the roubles and the central bank keeps the FX. The roubles eventually end up as deposits in the banking sector, partially replacing the central bank's lending to the banks. To explain the situation in everyday terms, the government is like a household that needs to pay bills but has run out of roubles. The household does have dollars and euros in its pocket, but is reluctant to spend them. Instead, a friendly central bank prints a fresh bunch of roubles and gives it to the government to cover those bills. This would explain why Russia's total FX reserves (which include the Reserve Fund and National Wealth Fund) have gone up by over $25bn to $393.7bn in the first six months of 2016. The Reserve Fund might have gone down by $11bn in H1 2016 to cover the budget deficit (which was 4.3% of GDP), but FX has been simply reclassified within total FX reserves rather than spent. The central bank has been building reserves by buying gold (and its price is going up), which might have added over $10bn to the FX coffers in H1 2016. A revaluation of the euro holdings added around $1-2bn. The largest addition (at over $10bn) seems to be the repayment of REPO loans by Russian banks back to the central bank. As to the budget deficits in 2017-19, they would be covered by the combination of money printing (and reclassifying rather than spending FX reserve funds) and an increase in net borrowing by the government. To keep the FX reserves (which seems to be the overriding priority), the central bank would need to continue monetising budget deficit by printing roubles to cover excess expenses. When the reserves run out notionally, the government would need to borrow. According to Reuters, the net borrowing would rise to over 1tn roubles a year in 2017-19. But the central bank could easily monetise some of the new government debt by buying it back from the banks. Essentially, it does not really matter when Russia runs out of the Reserve Fund or National Wealth Fund, except for accounting and, probably, for psychological reasons as it might be easier to push through spending cuts. The deficit is being financed by the money press rather than by spending the country's foreign exchange, and it is bound to be inflationary. Combined with a freeze on government expenditure in nominal terms in 2017-19, proposed by the Ministry of Finance, real incomes are likely to go down, taking with them consumer demand. Exports are already hitting the buffers on domestic capacity constraints and could suffer if global demand for commodities softens. While Russia's FX and gold reserves are solid and reports about their demise might be slightly exaggerated, it might be what is needed for the struggling Russian economy. are used to secure the whole of Russia's finance system. So if the 5th column scum are going to scream the "sky is falling"
to dent this pool of money in any significant way and there is no crisis. 2) Russian companies greatly reduced their foreign borrowing due to the sanctions and paid off a massive amount of debt. economy. The financial situation for Russia since 2014 is much worse than it was in 2008 and 2009.
laying the foundation for future growth. banking and at the same time is restricting Russian company finance operations. get serious about the CBR's abuse of its position. Austin, you really think some Reuters report on Russia has any credibility? Annexation of Crimea much? deficit financing buck naked. Yet I hear zero screeching about how they are doomed. I have already posted Hellevig's analysis of the consolidated Russian budget and that oil and gas account for 21% of it. use the same standard of analysis as for the precious west or bugger on off. are used to secure the whole of Russia's finance system. In 2008/2009 , forex was used to support the rouble not the budget , IIRC CBR burnt around $180 billion to support the rouble from getting weaker , still i recollect from memory rouble went down by few single digit number. I have seen contradictory on that some document I read says NWF and Rf are part of over all forex and some say its different , Can you pls point a document with facts on this ? Economic cooperation between Russia and China will develop regardless of Western pressure of Moscow, Deputy PM in charge of the defense industry Dmitry Rogozin says, adding noted that it was wrong to view sanctions as the main reason for this. “The People’s Republic of China is developing very rapidly today. In many spheres it has reached the level of development that is very interesting to Russia. We are building a mutually-beneficial technological and industrial cooperation between our countries,” Rogozin said after the Wednesday meeting with Chinese Vice-Premier Wang Yang in Yekaterinburg, Russia. Is Russia's Economy Doomed to Collapse? Austin wrote: Is Russia's Economy Doomed to Collapse? Official CBR gold reserves reached 1500 metric tonnes. According to XYZ center from the West, Russia is dying, Russia is collapsing, Russia is starving to death, etc etc. This is the later half of 2016 and seriously, there are still people saying such things ? Stolypin club offers his concept of "economic growth" to the Central Bank of the Russian Federation to launch a policy of "quantitative easing" to stimulate growth. The document also contains recommendations to increase the deficit of the Russian budget up to 3-5% of GDP, while external loans - up to 20-30% of GDP. In addition, experts Stolypin club call state is not afraid to use the mechanism of monetary issue to finance investment projects. At the same time they say that emissions should be limited, controlled, and directed at the investment payback. The amount of public funds allocated for investment growth should be at least 1.5 trillion rubles annually. Stolypin club members, named in honor of the Prime Minister of Russia in 1906-1911 years of Pyotr Stolypin, who has carried out an ambitious program of reforms in the Russian economy are, in particular, the presidential adviser Sergei Glazyev and deputy chairman of Vnesheconombank Andrei Klepach. Club members call themselves "marketeers - realists" and in many ways express the point of view that is contrary to the statements of representatives of financial - economic bloc of the government and the Central Bank.